The No. 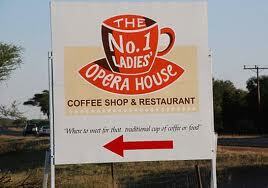 1 Ladies’ Opera Festival will take place from April 10-20, 2013 in Gaborone, Botswana. The festival will feature exciting performances by local and international artists, as well as workshops and master classes in vocal technique and operatic repertoire. It will culminate in an energetic closing ceremony including both classical and traditional music. A documentary will be made about the festival to promote the careers of several Tswana opera singers, and there will be a special focus on the theme of powerful women in opera. The goal of the festival is to equip and inspire emerging artists in Southern Africa while bringing attention to women’s issues through musical performance. We also hope to cultivate sustainable funding sources for local arts programs in Botswana. We are delighted to collaborate with David Slater Music, the No. 1 Ladies’ Opera House and the Maitisong Festival to launch an exciting new cultural event in Gaborone. So how did this project come about? Read the back-story HERE!